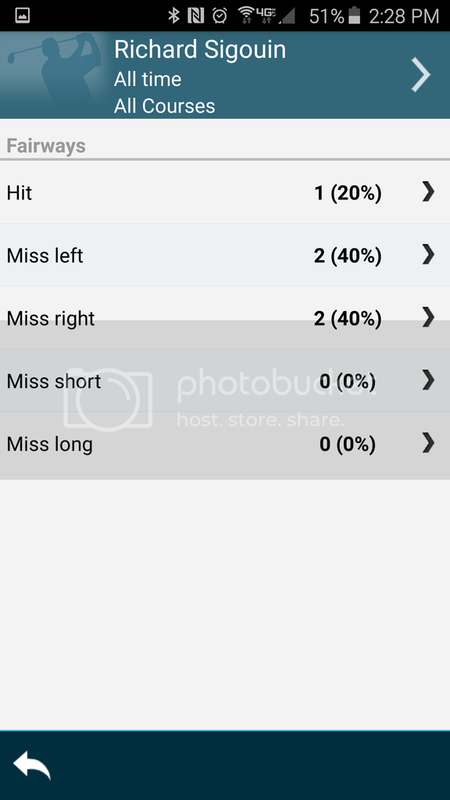 After many months of waiting for Arccos to release the Android version of their system, I decided to give up and look for other alternatives for shot tracking during my rounds. I'm a bit of a numbers geek and think that knowing my yardages and tendencies can do nothing but improve my game. 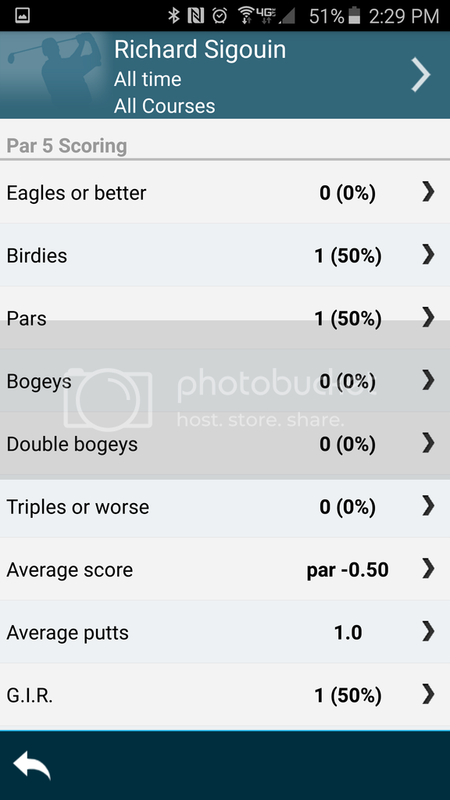 I looked into Game Golf and even downloaded their app to try out, only to be disappointed that you couldn't use their tags and app at the same time, so it provided no real time tracking capabilities. You had to wait to hook up the device to a computer to review and download your round. This was a major setback for me, because I already use GPS on my phone and Android Wear smartwatch, so carrying around another device is ridiculous. I want to be able to do everything from one device and Arccos has shown that can be done. 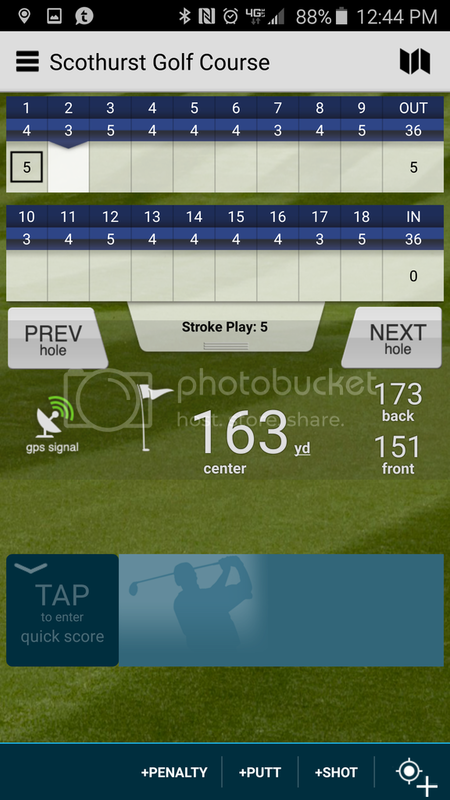 Enter Golf Pad GPS, an already well known golf GPS app for both Android and Iphone. They have developed an NFC based shot tracker that operates off of the same premise as Game Golf, but uses your existing Android smartphone with NFC technology to track the GPS and to tag your shots. I am already an NFC user, so this was nothing new to me. One note that I have to give is that your phone must be NFC capable in order for this system to work and there is a list of compatible phones on the golfpadgps website if you're not sure. The phone that I'm using for this testing is the Samsung Galaxy S6 Edge and also the Samsung Gear Live watch for the smartwatch testing portion. Supposedly using the watch along with the phone gives you a complete experience without ever having to take the phone out of your pocket. I've heard that one before, so we will test that out. So the package arrives today and it's a small box. 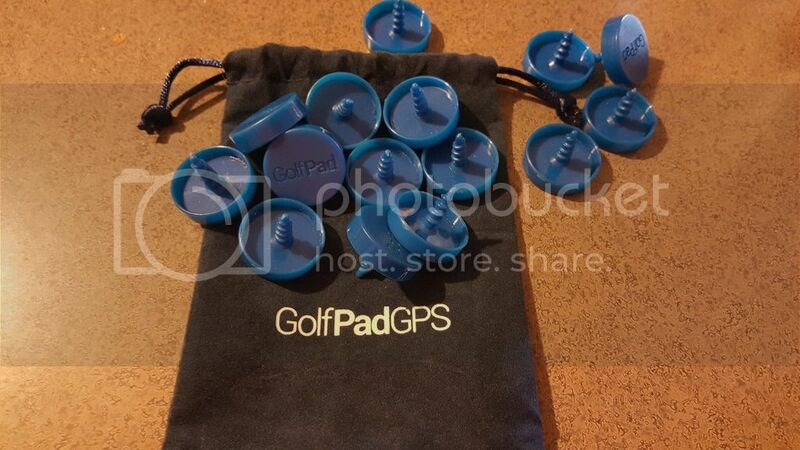 Inside are 15 small plastic NFC tags and a code for one year of golfpadgps premium upgrade. The next step is to simply install one tag onto each of your clubs. The tags screw into the grips securely, but I noticed a distinct difference in how tight I could get them depending on the grip type. I have NDMC's on my woods and CP2 Wraps on my irons currently and they screwed in very firmly on the NDMCs, but the CP2 Wraps are a much softer grip and didn't have the same positive stop at the end. I don't fear losing one, but I do feel much more confident in the ones that are in the NDMCs. You may notice that these tags are not labeled by club like other devices. It does not matter which tag goes on which club because as a part of the software setup on your phone, you will assign each individual tag simply by tapping it to your phone. 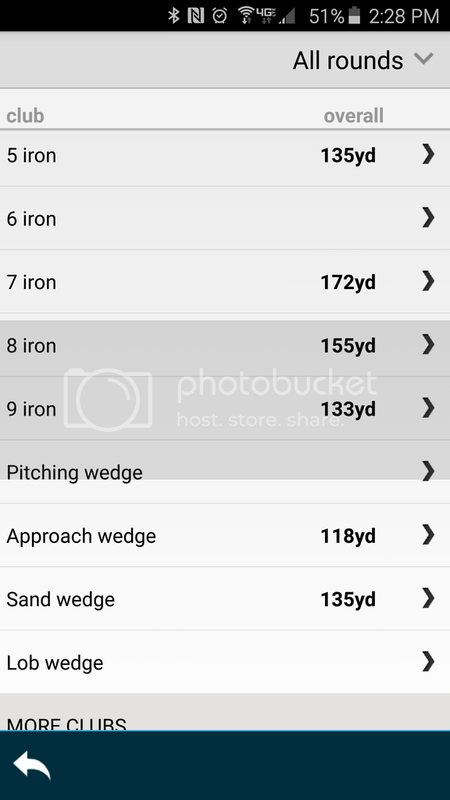 I simply downloaded the app, put in the premium code that I was provided and went into the app setting and enabled Golf Tags, which required me to make a couple changes to my phone. Of course NFC must be enabled, but you also have to go in and tell it not to turn the screen off automatically when the power button is pressed. I'm used to this because as an NFC user, I already know that NFC powers down when the screen is off which wouldn't work with the tags in your pocket. They did get around this by installing a "smart lock" screen, which keeps the screen on, but locks it so that you don't accidentally press the screen and dims the display to where it is barely on to save battery power. How much battery is this going to take for a round? I don't know yet, but we will definitely find out. I am going to take it out on the course this afternoon and test it out and try to grab some screenshots off both my phone and my Android wear watch to show the functionality. 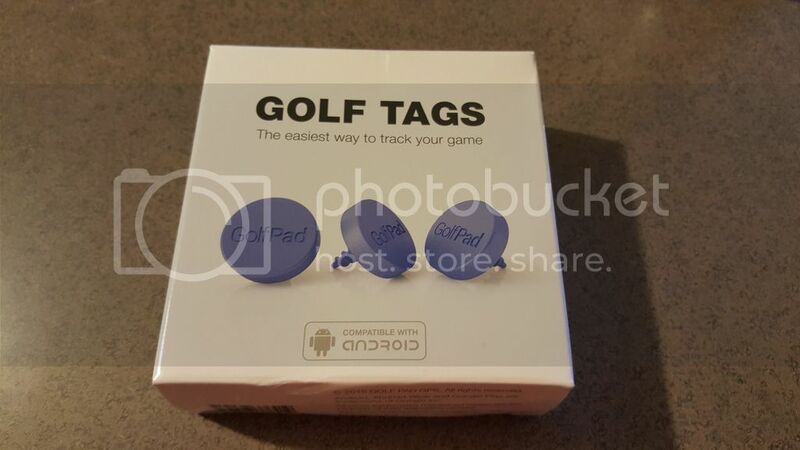 I have used the Golf Pad GPS app before and found it to be one of the best on the market, so I'm interested to see how adding the Golf Tags functionality into it affects the experience. Solid first review of this. Whats the price point of this product. I will be interested to see your thoughts of it once you get in play. Sorry, I should have included that. 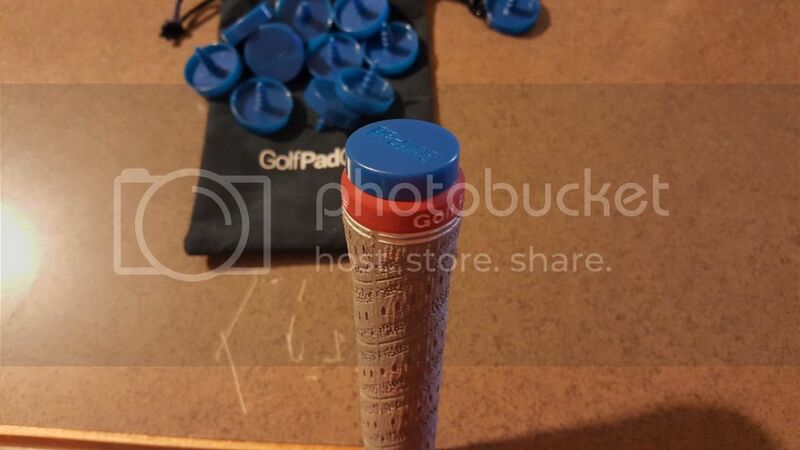 They are $99 ordered directly through GolfPadGPS or through Amazon. Much cheaper than the other alternatives because it's using existing NFC technology in most smartphones instead of using a separate device. I should also include that as of the current time, they do not work with the Iphone. The capabilities are there as their app works with the Iphone already, but Apple has locked down NFC on their phones so that it can only be used with Apple Pay and will not work with 3rd party apps. Interesting product. Look forward to hearing your thoughts on it after a few uses. The price point is great on these, I can't wait to hear how they work for you long term. I'm on the course now and behind 3 groups, so I have a few minutes to give some thoughts. Extremely easy to use and keeping my phone in my pocket isn't nearly as distracting as I thought it was going to be. It's feeding all the info I need straight to my watch, so my interactions with the program have been minimal. Time to tee off. More detailed thoughts to come when this round is over. very cool....wish that the Iphone would work. 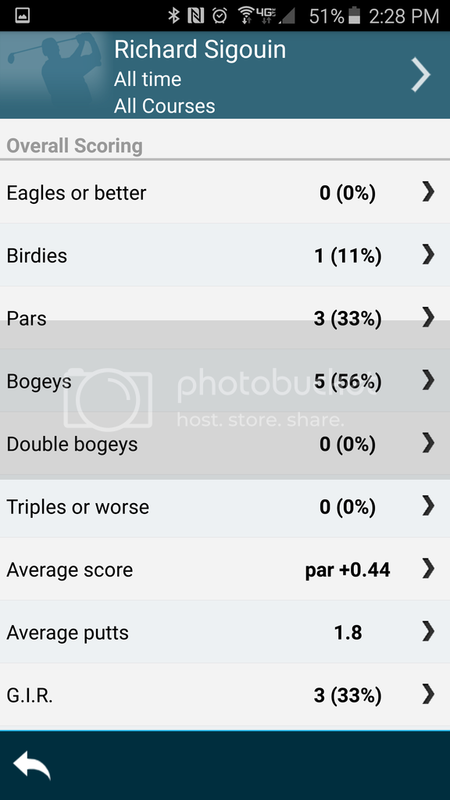 OK, I've played 9 holes using the Golf Tags, and for the most part I came away impressed. Pretty easy to setup and use, minus one bug that I've run across that I will discuss a little later. First, let's talk about the Android Wear interface. This was a great part of the program and if Arccos is anything like this with the Apple Watch, it's a great reason to buy it by itself. 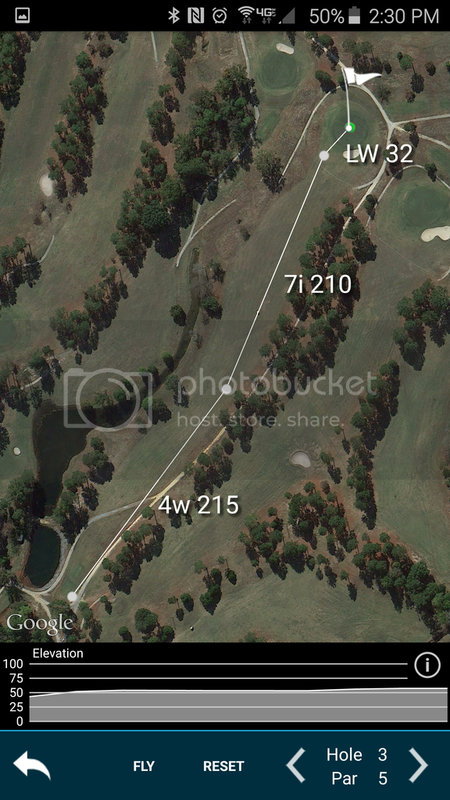 It constantly fed me yardage information like you would expect any GPS watch to. It gives front/back/center to the green. Nice to have and comparing the data with my rangefinder, it was never off more than a few yards. For the course I was playing, that's extremely accurate. Better than that was the interaction with the Golf Tags themselves. Every time I tagged a club, I got a notification on the watch that the tag was successful and it showed me which club was tagged. 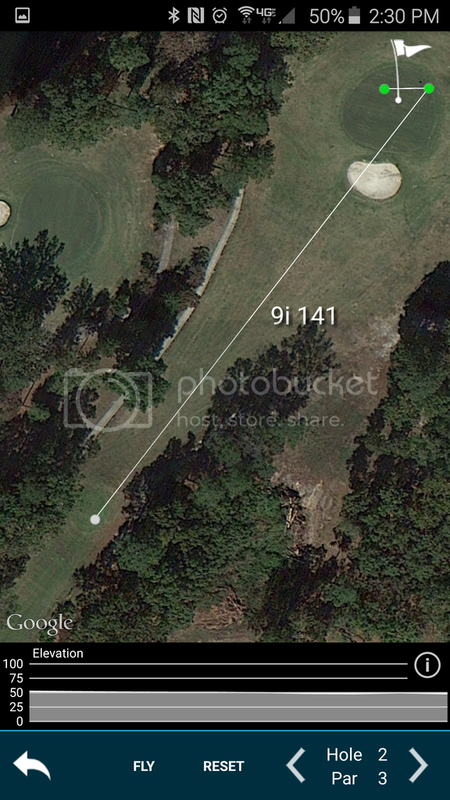 If there was a previous shot on that hole, it also showed me the distance that I hit the previous club to on the spot and instantly. Pretty nice information to have without even pulling the phone out of my pocket. 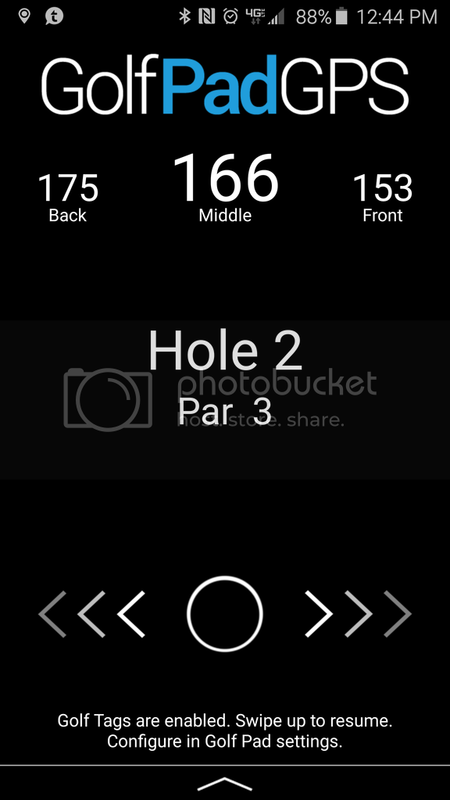 Using the interface, it also allowed me to manually track a shot (I didn't need to use this function with the Golf Tags), Add a shot, Add a penalty (I did use this once today unfortunately), and add a putt. 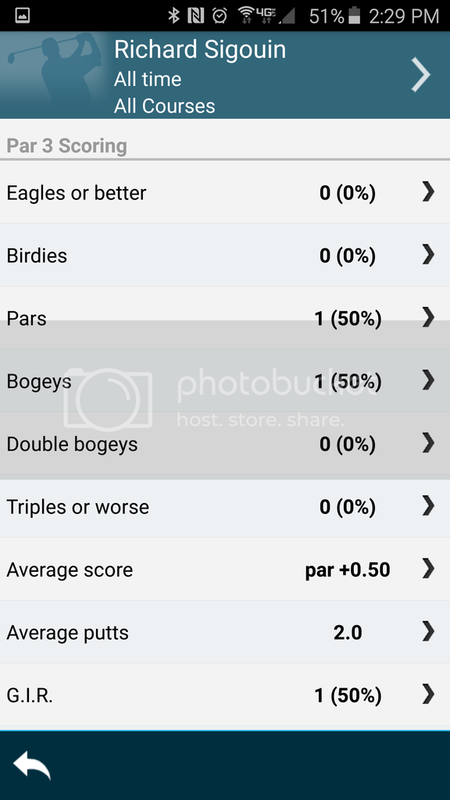 I'm assuming that the majority of this is available with the premium version of the app and was designed to work with the app alone not using the golf tags. It also let me skip to the next hole and start getting yardage using the watch. Very nice and simple interface for smartwatch users. If not for the one bug that I had, I would not have pulled my phone out at all during the round. I tried to get screenshots, but unfortunately I need to download a program to screencapture the watch because the stock screen capture doesn't save in a format that is really usable outside of Android. The App itself worked fine minus the one bug. That one bug was that occasionally the app would ask permission to send NFC data to their website. Even after I told it not to ask me again, it popped up a few more times. When that popup came up, it would not allow me to tag a club until I acknowledged the message, which meant pulling the phone out of my pocket which is what I didn't want to do. I am going to send an email to them to ask them about this issue and to see if they know a solution. It wasn't terrible, but it did take some of the hands off approach away. The tracking itself was a joy and extremely easy to use. Every time I tagged a club, the phone would vibrate and give me a tone in addition to the watch notification. After playing, the data is very extensive and similar to what I got with Game Golf, but with one great feature: It was available to me instantly on my phone instead of having to download the data to the computer. It does seem to be a bit battery hungry though. I used 25% of my battery in 9 holes. I was doing other things on the phone and also playing with the app quite a bit because it was new, but I would plan on 50% battery for a full round. Here's some screenshots I captured. There is a lot more data to look at, but it basically plots every shot for every club you hit. I think this could be extremely useful to me in the future. I've already learned a few things about my game in 9 holes. You hit a 7i 210 yds!? Very cool. Great price point and like the overall package with the phone and gps. Hoping they make a unit where you don't have to bump to tag shots. Yeah, I learned that shot when I was playing in Oklahoma. What you do is count on the fairway to be really hard, and then you thin a 165 yard layup shot and the ball just keeps on rolling......... I got probably 45-50 yards of roll out of it and the ball never got more than 20ft off the ground, but it was cooking...... Total mishit that worked out. It doesn't work very well on 165 yard Par 3's though. I wouldn't suggest using it there, although for some reason, I've done it before. Last edited by Bullitt5339; 05-13-2015 at 03:16 PM. That looks like a slick system at a good price point, to bad it doesn't work with Iphone. If Apple would unlock NFC to developers, it would be. That's all that's missing. Good luck with that, apple is known for being locked down, it means less issues with the OS but miss out on a lot of 3rd party accessories/apps. Great job on the initial write up...cant wait to see more.